Home / Beauty / Deals / discount / Fashion / sale / shoes / Skechers / Skechers Philippines / SCORE UP TO 50% OFF ON SKECHERS SHOES THIS AUGUST! Satisfy all your shoe cravings and more this August! 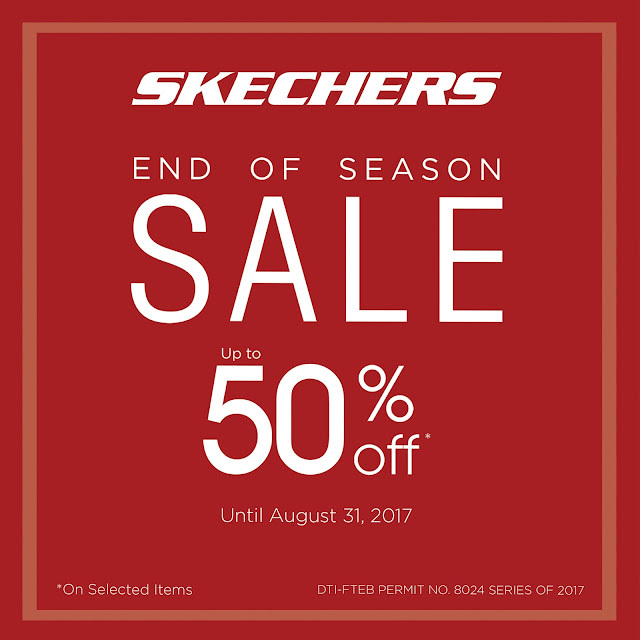 Skechers is treating everyone to an End of Season Sale with up to 50% off on selected items! For fans of Skechers’s ultra comfy Memory Foam, we’ve confirmed such styles are in the mix. Also included in this amazing sale event are the ultra popular Skechers GOwalk that makes walking not only comfortable but practically effortless for urban warriors, travelers and commuters. Their top-of-the-line Skechers GoRun category is also offering awesome deals for runners and anyone looking for superior support and performance. Don’t forget to share the comfort and fun with your little ones! Skechers Kids has everything from P.E. sneakers to street style and light up kicks with memory foam. All shoes on sale are designed with advanced comfort technology and a broad range of stylish designs so there’s a perfect pair for everyone! Don’t miss out! Head to the nearest Skechers concept store and treat yourself and the entire family to comfortable, stylish footwear with these amazing deals! Visit Skechers concept stores located at Glorietta 2, Trinoma, SM North Edsa -The Annex, Ayala 30th, Gateway Mall, Market Market, Robinsons Place Manila, Lucky Chinatown, SM Mall of Asia, Alabang Town Center, Festival Mall, SM Southmall, SM Bacoor, Robinsons Gen. Trias, SM Dasmarinas, SM Lipa, SM Fairview, Ayala Fairview Terraces, SM Clark, SM Pampanga, Marquee Mall, SM Cabanatuan, Robinsons Place Ilocos, Ayala Malls Legazpi, Ayala Center Cebu, SM City Cebu, SM Seaside Cebu, SM Bacolod, SM Iloilo, SM Davao, LimKetKai Mall, and Centrio Mall. To learn more about Skechers, visit www.skechers.com.ph, www.facebook.com/SkechersPH and follow @SkechersPH on Twitter and Instagram.